Bayern Munich avoided Alba Berlin’s impressive comeback, won Game 3 of the German League Finals and currently lead the series 2-1. 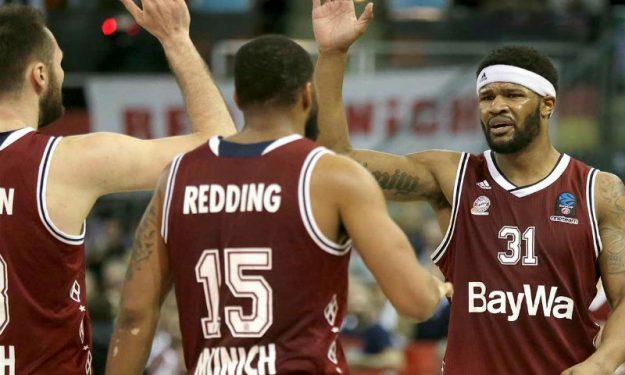 Reggie Redding had a solid game for Bayern, and so Munich’s team defeated Alba Berlin 72-66 in Game 3 to protect home court. Since the start, the hosts had an eight-point lead (14-6) and picked up an 18-point lead in the third period (52-34) as Reggie Redding was leading the way. In the final period, Alba Berlin sparked a comeback and with a 6-12 run in the first six minutes of the fourth quarter cut the deficit to just seven points (67-60). With a minute on the clock, Alba kept on making shots and made the contest a two-position game. The timing, however, did not help the visitors, and their effort eventually fell short, as Bayern made its free-throws to ice the game. Redding led the way for the hosts with his 18 points and six rebounds, while Lucic, Djedovic added 10 and 11 points respectively. For the visitors, Spencer Butterfield with 16 points and Peyton Siva with 15 sparked the comeback and challenged the hosts.